Quick! 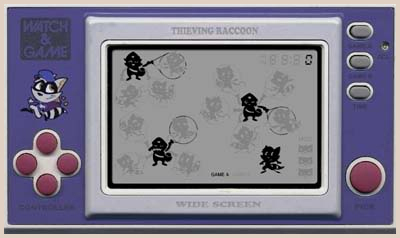 Help Slick Dooper, the world’s most sly raccoon criminal, pick the pockets of the guards without getting caught! –Avoid the flashlights and pick any guard’s pocket to earn one point. The coin in the guard’s pocket will reappear over time and you can pick his pocket for another point. Accumulate as many points as possible without getting caught. Getting caught three times resets your score. Every 30 points will erase an existing miss. –Choose one of two game modes. Game B is less predictable then Game A. –ARROW KEYS move you around. –MOUSE CLICK the “Game A” or “Game B” buttons to restart with a different game style. –MOUSE CLICK the “Time” button to tell time. Hold it down to see High Scores. My entry for the TIGsource Bootleg Demakes competition. It tied for 12th out of 69 games! Chosen as #9 in Bytejacker’s Top Ten Bootleg Demakes!